You are here: Home / Crochet Other / Link Parties / Featured: Granny’s Crochet Pansy Pattern. Featured: Granny’s Crochet Pansy Pattern. 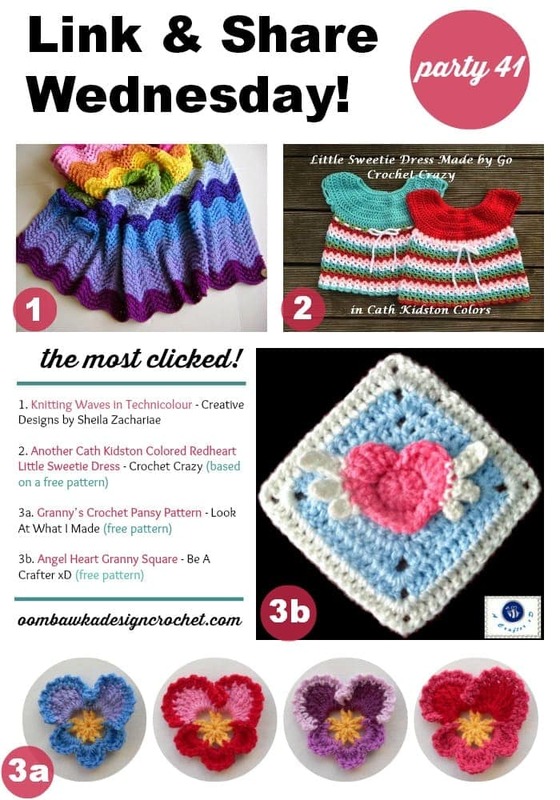 This week we feature: Granny’s Crochet Pansy Pattern, Little Sweetie Dress, Knitting Waves in Technicolor and Angel Heart Granny Square! If you would like me to consider your project photos (crocheted using free crochet patterns) for Free Crochet Pattern Friday Round Ups, or if you are a Crochet Designer and you would like me to add you to my list of approved sources please read this post: Would you like to be featured? and here are our featured favourites from Link & Share Wednesday Party 41 as chosen by you! 3. Visit and comment on your favourite submission by the end of the day on Sunday to help choose the featured favourites! I have made an executive decision to discontinue the weekly crochet twitterhop. Thank you to everyone who attended in the past. I plan to hold a monthly Crochet Twitterhop in its place. See you back here the 1st Wednesday of next month! If you would like to co-host the monthly Twitterhop on your own blog, please contact me and I will provide you with the information you need to set it up.